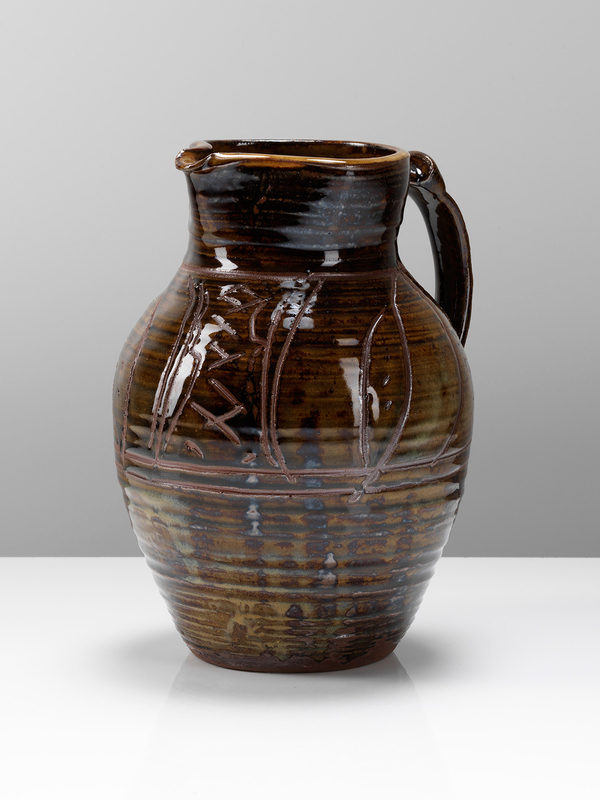 Michael Cardew took a degree at Oxford but decided to devote himself to the potter's craft. He joined Bernard Leach and Shoji Hamada at St Ives in 1923 where he began to develop his interest in the English slipware tradition. In 1926 he set up on his own at a traditional English pottery at Winchcombe, where there was a very large wood-fired bottle kiln. The clay was dug from the land adjacent to the pottery. Most of the output of this period 1926-1939 is slip decorated earthenware with galena glaze. The pots in this collection are nearly all of this period. In 1939 he leaves Winchcombe in the hands of Ray Finch who eventually bought it in 1945 and has continued there ever since. In 1939 Cardew set up another pottery at Wenford Bridge but the war disrupted his plans. In 1942 Cardew first went to Ghana as a pottery instructor and later set up the Pottery Training Centre in Abuja, Nigeria. He remained in West Africa for long periods until his retirement in 1965 helping to develop stoneware using local materials. His later work is strongly influenced by his African experience. The pottery at Wenford Bridge was run by the Australian, Ivan McMeekin and from there Cardew produced stoneware with painted decoration. He also spent time in his latter years lecturing, travelling and writing. He was awarded an MBE in 1964 and an OBE in 1981. His autobiography Michael Cardew, A Pioneer Potter was published posthumously by his son, Seth in 1988.